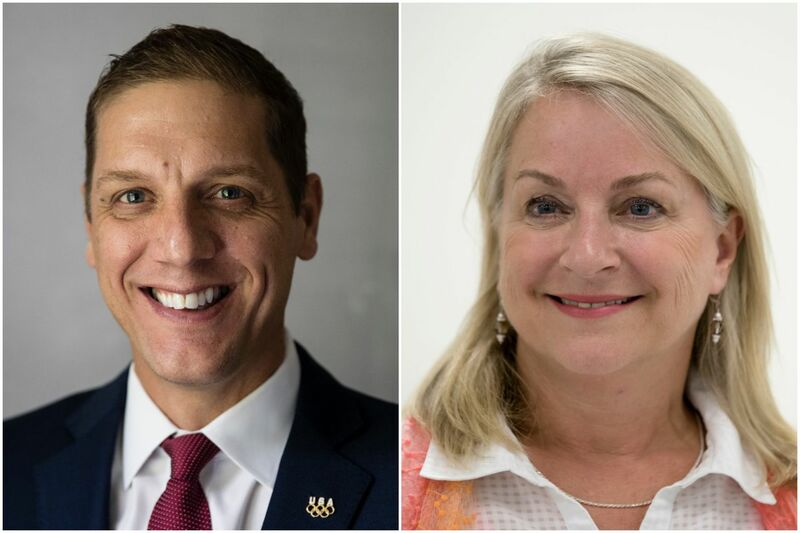 Republican Marty Nothstein (left) and Democrat Susan Wild are competing in Pennsylvania’s 7th Congressional district, in the Lehigh Valley. Former Congressman Charlie Dent, a Republican, retired earlier this year, leaving the seat open. Republicans are increasingly worried that a key U.S. House race in the Lehigh Valley is slipping away. Marty Nothstein has struggled to build momentum in Pennsylvania's Seventh Congressional District, where he is competing with Democrat Susan Wild to replace Charlie Dent, a moderate Republican who retired this year. Nothstein was a local hero when he won Olympic gold in cycling in 2000 and is now a Lehigh County commissioner — but GOP operatives and insiders have been sharply critical of his campaign, marked by sluggish fund-raising. Two key Nothstein staffers left in August: Charlie O'Neill, his campaign manager, and Adam Ballek, the fund-raising chief who had helped Dent for years. And while national Democratic groups are starting to put money into the race, national Republicans are noncommittal about whether they will spend on Nothstein's behalf. A poll this week showed Wild with a substantial lead. "At this point, the traction isn't there," said Josh Novotney, a Republican consultant from Philadelphia. Privately, four other Pennsylvania Republicans were more pessimistic. Several pointed to the fund-raising gap as a proxy for the overall campaign energy: Wild raised $1.1 million as of June 30, the last reporting date, while Nothstein had brought in $531,000 — more than a quarter of which came from his own pocket. Nothstein's campaign spokesperson said the race was still competitive. "If this race is over, we haven't noticed," Dennis Roddy said. As for discord or staff churn, he said, "there's no more than you get in most political campaigns or, for that matter, in most newsrooms." The race is widely seen as one of the Democrats' best opportunities to pick up one of the 23 seats they need to take control of the House — and among at least a half-dozen the party hopes to add in Pennsylvania and New Jersey. A New York Times Upshot/Siena College poll this week showed Wild, a former Allentown solicitor, with a 50-42 lead among likely voters. The poll, with a margin of error of 4.7 percentage points, is in line with what Republicans say they have seen. Another September survey, from Monmouth University, showed a much tighter contest, and Democrats have raised concerns about the energy level in the race. Roddy said that the campaign manager left to work on another congressional race outside Pittsburgh and that the fund-raising aide felt "he'd done what he could do." Neither could be reached by the Inquirer on Wednesday, but three people with knowledge of their departures attributed the decisions to concerns about the campaign. After its boundaries were reconfigured, with other districts, by the Pennsylvania Supreme Court, the Lehigh Valley district is evenly balanced. Democratic presidential nominee Hillary Clinton won it by one percentage point in 2016. But with the national political winds behind Democrats and no incumbent on the ballot, the trends point in Wild's direction. Many of the district's voters live in the kind of affluent, well-educated suburbs that have revolted against President Trump and the GOP. Many supported Dent, who became nationally known as an independent voice. In the Times/Siena poll, 54 percent said they wanted a representative to serve as a check on Trump, against 40 percent who said they wanted one who would support the president. Among Republicans, 12 percent said they valued having a member of Congress acting as a brake on Trump, as 85 percent hoped for a representative who would support him. The gender gap also mirrored national trends: Fifty-four percent of women supported Wild, while 38 percent backed Nothstein. Men were evenly split. "Susan Wild is in a strong place," said Rep. Ben Ray Lujan (D., N.M.), chairman of Democrats' congressional campaign arm. "We know that this is one of the strongest districts in America that we can pick up." The head of the Republican congressional campaign, Rep. Steve Stivers (R., Ohio), predicted the race would be "really competitive" but was noncommittal about the national party's support for Nothstein. "We have some money parked in Philadelphia that could be used for that race, and I think we're waiting to see what happens there and we may be in there," he said. He was referring to ad reservations in the city's media market. The Nothstein staff departures came in August, shortly after the candidate faced a report of a sexual-misconduct investigation stemming from an incident that supposedly happened nearly 20 years ago. Nothstein unequivocally denied he had done anything wrong, said that investigators had cleared him, and that the accusation was a political smear. Democrats, though optimistic, did raise some warning signs. The Monmouth Poll found that Wild was not drawing the same enthusiasm as Democrats in other competitive races. And the Seventh District, which includes Allentown, has the largest share of Hispanic residents of any competitive seat in Pennsylvania. National polls have suggested that Hispanic voters are not as engaged as others in the midterm races. "I don't think we will match the intensity or the enthusiasm that's being demonstrated in other parts of the state," said T.J. Rooney, a former Democratic state chairman from the Lehigh Valley, though he still predicted a Wild victory. Wild’s campaign declined to comment.